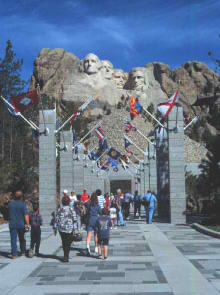 The Shrine to Democracy features the 60-foot high faces of four American presidents sitting 500 feet up looking out over South Dakota’s Black Hills. Presidents George Washington, Thomas Jefferson, Theodore Roosevelt, and Abraham Lincoln were selected by sculptor because of their role in preserving the Republic and expanding its territory. Controversy was involved with the construction of the monument because the Black Hills area was granted by an early treaty with the US to the Lakota Sioux. The US later exerted a claim to the area. 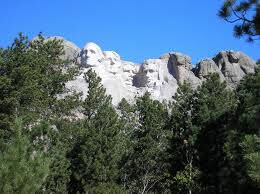 In 1927, sculptor Gutzon Borglum who had worked on the Confederate Memorial at Stone Mountain selected the Presidents to be honored and began drilling into granite of the mile+ high mountain near Keystone, South Dakota. After 14 years and $1 million the project was completed by Lincoln Borglum with no loss of life. The Avenue of Flags, the primary approach to the monument, features the flags of all of the states and territories. The Memorial is managed by the National Parks Service. FYI, the monuments were originally designed to be carved from waist up. The design was modified to busts only due to financial limitations. The original carving of Jefferson that was located on Washington’s right but was dynamited and recarved because of technical problems with the rock.